who's talking about your research? As a researcher, you do not only want to keep track of your scientific output, you also want to get a clear insight into the social impact of it; scientific communication does not stop after your research is published! Have a look at this overview of ALL REPORTS van ALL UMCG Research Insitutes and programms with Altmetric "mentions" directly related to UMCG publications! Altmetrics can be a valuable and additional tool to monitor and report on the attention surrounding your research. 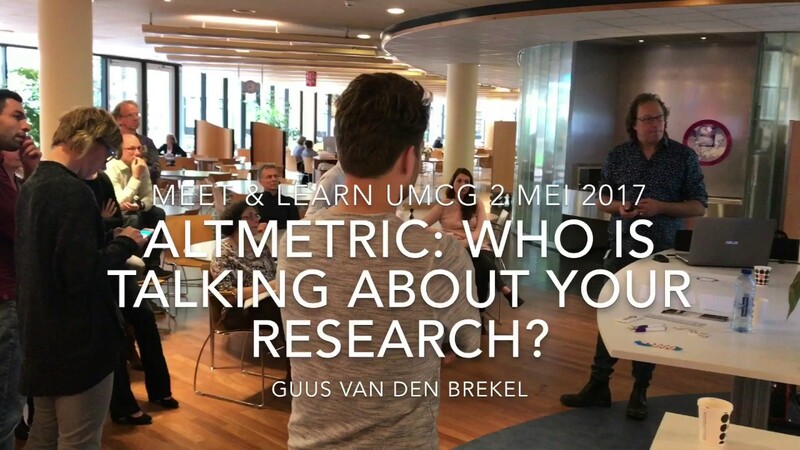 The Central Medical Library has launched an Altmetrics project in collaboration with researchers and other stakeholders in the UMCG to raise awareness about changing communication (and its importance) within science. The date of the UMCG Altmetrics Dashboard are from the RUG research database Pure, which collects the UMCG publications, including all research institutes, research programs and researchers. The Altmetric dashboard adds additional statistics to these publications, such as the number of tweets, blogs, news posts, post peer reviews or policy documents that mention a publication, anywhere in the world. Do you also want access to the Altmetrics UMCG Dashboard? Or do you want to know more? Please send an email to a.j.p.van.den.brekel@umcg.nl or cmb@umcg.nl. Last modified: 20 December 2018 12.20 p.m.